Need help growing your Shopify sales? We have earned a reputation of being good at what we do. Let us take your online shop to new dimension in success! Save time and frustration by visually editing your site. Build professional layouts in just a few minutes. First impressions of online store is 94% design related. Quality web design establishes trust and credibility. It's very easy to install the demo just by a single click. It’s totally automatic and save your time. Performance matters the most for your online shop ! We leverage the strategy and help you earn maximum ROI. Build your own professional online store with Drag & Drop sections. Create your dream store with no coding required. A great collection of beautiful shopify themes for your need. Choose the best suitable theme and start customizing it. it allows you save more money as well as time and create store without additional cost. Get trouble in choosing your theme? Don’t hesitate to ask. Belle – Responsive Shopify Theme with clean & modern design for your online fashion store and other web shop. Belle perfectly and beautifully mix and match colors, banners, sections… to give the whole design gorgeous look. Belle has a full screen banner for your store to showcase hottest and newest products to immediately catch your customers’ hearts. Belle fully supports sections and is packed with features like product row sliders with tabs, product rows, mega menus, Brand logo list, Instagram photo gallery, collection list, interactive mini cart, product swatches, product quick look, Ajax product filter, large block banner and many more… Product and collection sections are nicely and professionally display for your customers to easily find the information they need. The design is very elegant and modern, and also very easy to customize without touching a single line of CODE. This theme is great for selling physical products, it has all the things you need exactly where they need to be, like the phone and shipping in the header and on every page. Their customer support is superb! I had a couple little things I couldn’t get to work and they were fixed ASAP. Additionally, I asked for some custom work to be done, it was done very quickly at a reasonable price exactly how I asked it to be done – and on the first request!! I love this theme and working with the team that built it. It’s a super quality product. I’ve worked with a few themes and let me say this isn’t just a very very good theme for Shopify stores, but the customer support is something outstanding. I needed a few changes here and there to have a better look, and every time, in less than 24 hours, Sejal and the customer support team made all the changes I wanted in perfect manner. I can’t be any happier, my site looks amazing and I highly recommend this to anyone! So far this theme is working out great. This is a fast theme,the code is clean, and has a number of features that I was looking for. Support is super helpful so far. I have needed some small customization and they have been more extremely responsive. I would like to see a few more features added in the future, but this theme is off to a great start. 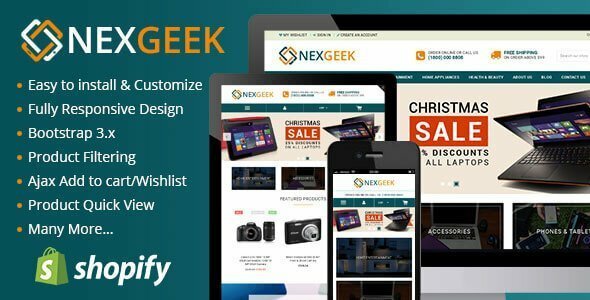 I highly recommend this theme and the authors, and this is coming from someone who is quite experienced with Shopify themes and Themeforest themes alike. Great theme, lots of things to customise to your needs, customer service is absolutely amazing, they’ve fixed a few issues for me very quickly and also did a few custom requests for us to make our site more usable. Great product and great team, they’ll help you with anything you need.